A Florida native, but long based here in Atlanta, artist Robbie Land uses 16mm film to create a personal vision of the environment of the southeast United States. Using unusual methods of film developing, manipulating his own carefully shot footage, and even pasting plant life and other items directly on to the film strip, Land works painstakingly with celluloid film to create vibrant, colorful, haunting imagery. His films reimagine our familiar surroundings, both natural and man-made. Recently, Robbie Land has completed a group of four long-awaited new films, including the twenty-minute opus Floridaland. For our first show at the Museum of Contemporary Art of Georgia, Film Love is proud to host Land in person for premieres of these works. Land will introduce the films and answer questions about them, as well as show a selection of older films. Precipice is an unconventional dance film in which Land photographed and re-photographed dancers to achieve a pointillist texture, then re-choreographed the dancers in the editing. Created without a camera, Old Florida Salt Marsh is animated with collected images cut, glued and taped directly to the celluloid. Micanopy Winter Wonderland documents an antique jukebox from a logging town, which was converted into a diorama winter wonderland scene with animated characters that move to the crude sounds of an old 78rpm record. Floridaland documents defunct Florida theme parks from 1960s, 70s and 80s, creating a personal reflection on the changes in our environment over time. All the films will be shown in 16mm. This screening is sponsored in part by the Atlanta Office of Cultural Affairs. 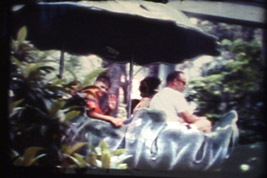 ROBBIE LAND: FLORIDALAND AND OTHER NEW 16MM WORKS is a Film Love event. The Film Love series provides access to rare but important films, and seeks to increase awareness of the rich history of experimental and avant-garde film. The series is curated and hosted by Andy Ditzler for Frequent Small Meals. Film Love was voted Best Film Series in Atlanta by the critics of Creative Loafing in 2006, and is featured in Atlanta Magazine’s Best of 2009. Archives of the series may be found at www.filmlove.org.